Among other games of chance, baccarat, apparently, occupies one of the first places, regarding the number of myths and mysteries, surrounding it, much because of the fact that the game used to be the nobles’ entertainment at the dawn of its history, so average people got no idea of what it really was. Time has passed and in modern times baccarat has become a commonly-played game, which is affordable to everyone, as the betting minimums are rather low. Nevertheless, the game’s charm has been preserved, and baccarat is still frequently considered the so-called “exclusive” gambling game, which is even now, by the way, played in a separate area in live casinos. For a beginner, who wishes to try playing baccarat, it’s not at all easy to pull him/herself together at once, therefore a set of handy baccarat tips would turn out as useful to rookies in the same way, as the specific advice, given to inexperienced blackjack and roulette players, is helpful to them. Common gambling tips turn out beneficial for all players and, in this respect, baccarat admirers aren’t the exception of the rule. 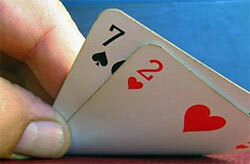 Among three possible variants, the bet on the Banker in an 8-deck game appears to be the most advantageous one, as it tends to win more often. Therefore, the experts suggest that if there’s a chance, one should always opt for it, even if someone advises them not to do it because of the predefined 5% casino commission. NEVER bet on the Tie. Whereas the Banker, as it has already mentioned is the best bet among the others, the worst one is the Tie. Notably, although most land and online casinos offer considerable payoffs to players, having chosen a Tie to bet on, it, actually, presupposes the 8% house edge, so the gamblers are advised to avoid selecting it. Likewise as in blackjack and roulette, there’s no casino system, which can give a 100% guarantee of winning, but some of them might be beneficial in short-term games. In this respect, one of the known baccarat tips states that Martingale system, for instance, will help the player win, but only if he/she knows when to stop betting. All things considered, even if one hasn’t managed to study the whole bunch of baccarat tips in advance, he/she will surely learn all inns and odds of the game through practice, so there’s really nothing to worry about, except for the one’s reasonable bankroll management.